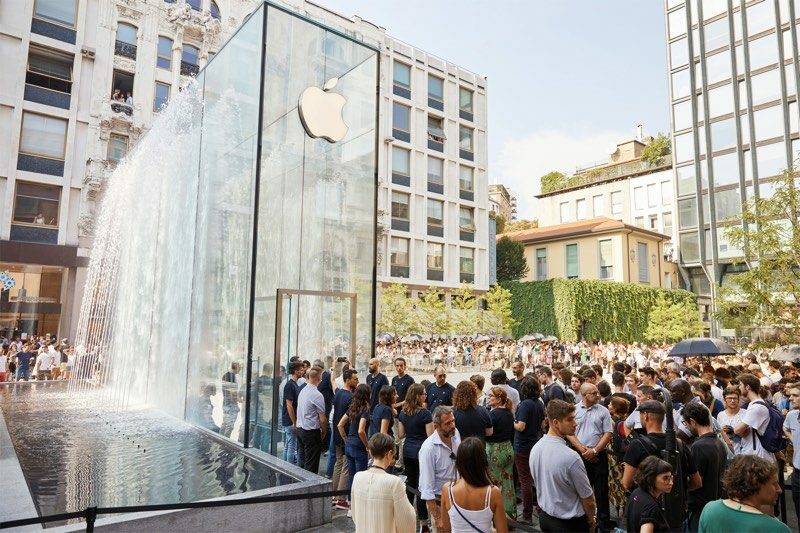 Apple's newest flagship Apple Store, Piazza Liberty, opened in Milan, Italy today and to celebrate the occasion, Apple shared some images of the new location. 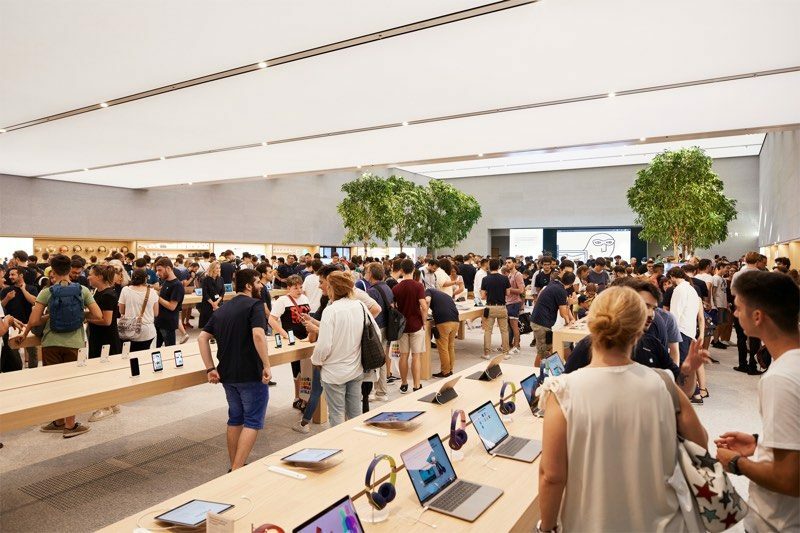 Piazza Liberty is the first Italian Apple Store to feature the updated Apple Store layout with areas that include Genius Grove, The Forum, and The Avenue, aka parts of the store dedicated to activities like support, classes, and shopping. This new flagship location features a huge fountain with water cascading over glass walls that customers walk through to enter the store. Piazza Liberty includes a public plaza where visitors to the store gathered ahead of its unveiling, and Apple plans to host Today at Apple sessions and performances all weekend at the new location. Milanese artist L I M was on hand to perform during the store's launch. 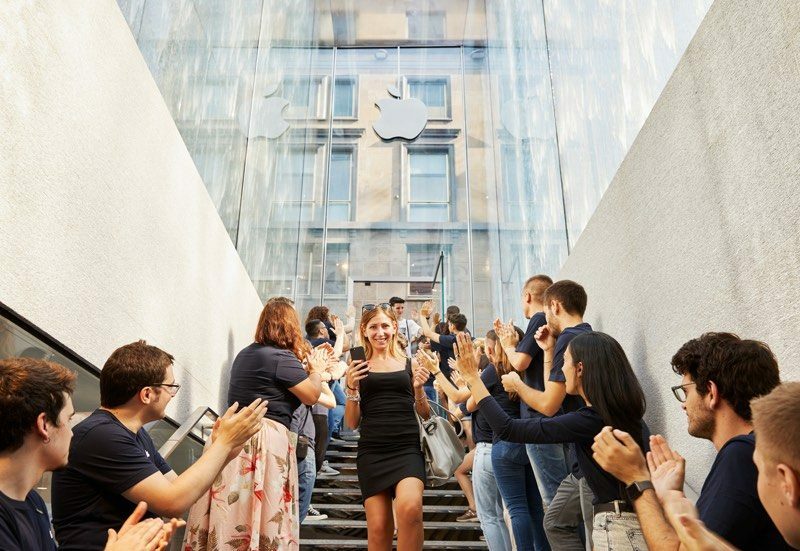 Customers who visited the store early received free tote bags and artist books, and Apple retail chief Angela Ahrendts was on hand to greet guests. Ahead of the store's opening, Apple worked with 21 local artists to celebrate the creative community of Milan. The store is home to 230 new Apple retail employees, many of whom Apple says came to Milan from Apple stores around the world. 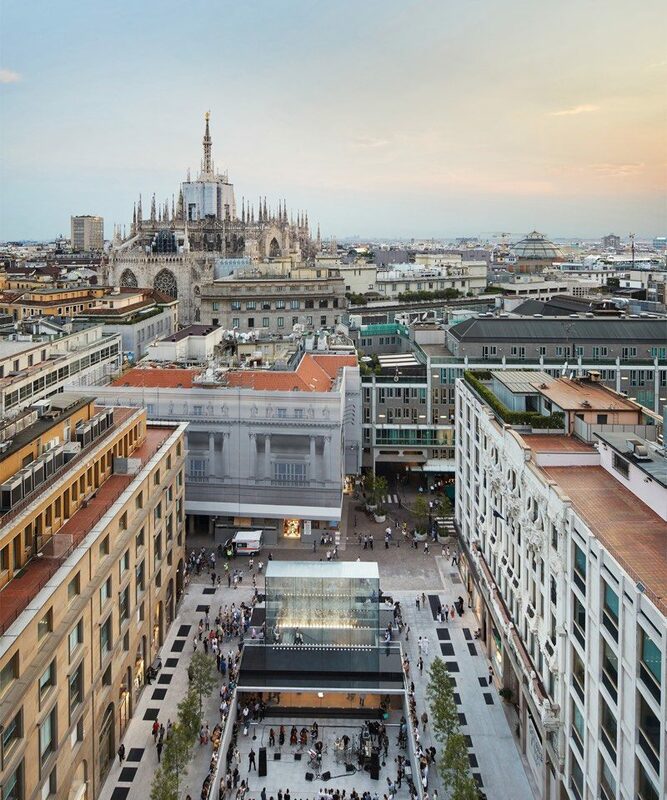 Counting the new store in Milan, Apple now has 17 retail locations across Italy. That's one seriously cool design, for a seriously cool city. Does any other company come close to pouring as much money into their retail stores? The outlay for these buildings and locations is astounding. Another fancy store for Apple to sell 4 year old computers and dongles. Sees new Apple Store... turns to go in...sees rows of staff waiting to clap me down the stairs...makes prompt 180° ('https://www.degreesymbol.net/') turn. I'm not sure I'd class a company building a new store (or modernising an old one) to lure more customers in and increase profits as 'giving back' in any way. Thank you Apple, still zero Apple Stores in Finland. I hope Angela has a WONDERFUL time. Must be great when you don’t know what country your boss is handshaking in, and watching your flagship notebook have problem after problem. The store is just amazing! Remember when Apple was known because it was used (mostly) by talented people?... Now we need a PC to draw on our computers and try to hype up retail stores. A huge off-topic PRSI thread derailment has resulted in numerous posts being deleted or edited to bring the discussion back on-topic. Please take your PRSI discussions to the correct forum. Threads and posts on controversial political, religious, and social issues are to be limited to the Politics, Religion, Social Issues forum, and made only by those eligible for that forum.